Too early to start planning your Thanksgiving menu? Think again. Stop by the market this Thursday November 4th as BLOODROOT RESTAURANT presents vegetarian stuffing fit for your holiday table or any really any table. Their CHESTNUT STUFFING with shitake mushroom gravy starts with their own bread crumbs (don’t even think of NOT eating their bread when dining there) from the previous day’s choice of house baked potato rye, oatmeal sunflower or whole wheat loaves. They combine those precious crumbs with chopped and roasted chestnuts, bright orange squash, pumpkin seeds and gently sauteed onions and shallots. This combo would be perfect on its own or alongside your holiday entree. Celeriac apple puree is the base of the luscious filling in BLOODROOT’S FILO PASTRY SHELLS. You will have an opportunity to taste this chunky blend which includes chopped, toasted hazelnuts, braised endive and sauteed oyster mushrooms. 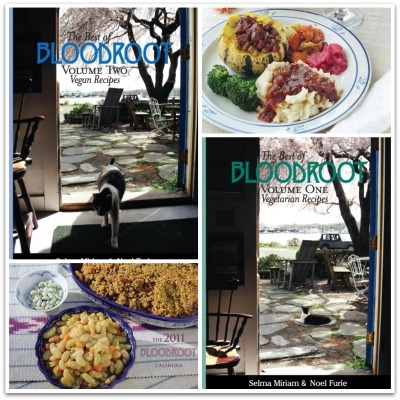 BLOODROOT is a restaurant in the BLACK ROCK section of Bridgeport that has flourished for 33 years. This feminist, vegetarian restaurant is part collective, part book store, part weaving center. It is FULLY about seasonal, organic, ethnic, ethical ingredient sourcing and flavorful dishes. Selma Miriam and Noel Furie provide the foundation, in spirit and effort, of this landmark eatery. They are the original members of the collective that conceived of and started this restaurant in 1977. Their commitment to seasonal, vegetarian ingredients has not wavered as their menu continues to evolve and change with the growing seasons. Miriam and Furie shop the Westport Market for ingredients they don’t grow themselves. They are among the early crowd each week as they visit Riverbank Farm for their organic veggies, Newgate Farm for unusual fruit varieties , Beltane Farm for goat cheese, Beaver Brook Farm for sheep’s milk cheese and Cato for their Hooligan cheese. Their website provides fascinating information about their politics and food choices. It also includes a number of essays, including the riveting introduction to THE POLITICAL PALATE, their feminist, vegetarian cookbook. BLOODROOT cookbooks and their beautiful 2011 calendar, replete with food photos and recipes, will be available at the market, along with tastes from their changing menu.